New Wellness Programs Coming Soon! Beginning April 8, 2019, Health and Wellness Center (HWC) patients will have access to all new wellness programming through My Health Onsite! Patients will work one-on-one (telephonically, electronically, or face-to-face) with a member of My Health Onsite's wellness team, which includes an onsite Nurse, Registered Dietitian, Nurse Educator, and Health Coach. Click here to learn more! Accessing the New Patient Portal - No Code Required! To access your new paitent portal, simply follow the instructions in the email invitation sent from "no-reply@eclinicalmail.com" which includes your user name and temporary password. Click here for more information. If are currently covered under the District's group medical plan and you have not received the email invitation, please call 1 (888) 644-1448 to update your email address. Aerobic activities (meaning “with oxygen”) increase your heart rate and make you breathe harder. Common aerobic activities include running, jogging, brisk walking, bicycling, and swimming. Muscle-strengthening activities also help bones and joints. The most common example is weight training, but working with resistance bands (stretch bands), climbing (rope climbing, rock climbing), and certain exercises all contribute to overall strength. These activities also help with posture and injury prevention. Click here for information on fitness deals you can take advantage of as a Florida Blue member through the Blue365 Discount Program. 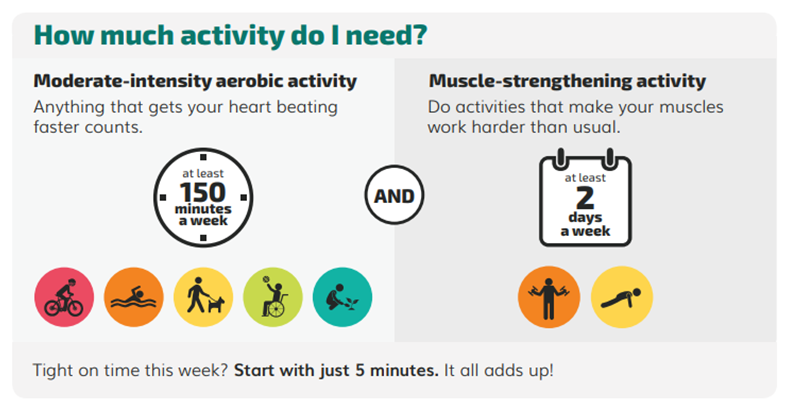 This month, set a goal to do some type of physical activity most if not every day of the week!